Ruby’s exhibition, Point of Interest, explores wanderlust of the South West. Having moved to New Mexico site unseen, she has spent the past four years feeling like a perpetual tourist. The views go on for miles, and there is much to be seen along the side of the road. This exhibition is about what she has found, driving around in her white truck named Falcor. The work will primarily consist of a large-scale site-specific installation that will consume much of the gallery space. Ruby Troup received the SURFACE 2018 Harwood Art Center Solo Exhibition Award, presented annually for artistic excellence, originality of vision and dedication to practice. 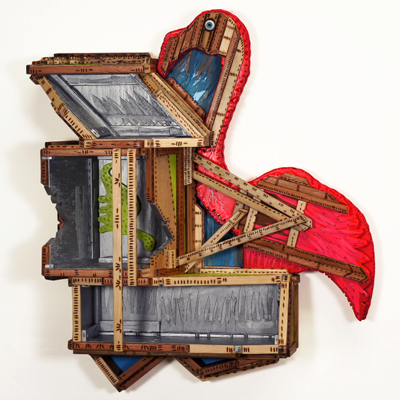 Ruby Troup is an artist who uses wood to create highly narrative work based on her formative years, and on the environments in which she has lived. Her forms are evocative of the body, landscape, and vernacular architecture. Often using reclaimed materials and a wide variety of surface treatments, Troup explores ideas of transformation, growth, recollection, place, and home. Ruby lives and works in northern New Mexico and has a BFA from the Herron School of Art and Design and a MFA from Virginia Commonwealth University.